It has been a while since I participated, but decided I needed some grounding by getting back to basics while everything is swirling around me. It’s cold and rainy here. I mean cold, it’s 38 degrees. Cooking for my family and being organized. I’m still playing catch up with the DVR from the time away. I still haven’t decided. It’s recipe experiment night, but with the weather and not feeling well, it will be something simple. Etsy, Ebay, Vacuum, laundry, paint – always something that needs a second coat of paint. Actually being done with the major projects and having some time to enjoy the house before it sells. Soak your wooden utensils in mineral oil twice a year to keep the wood from splitting. I’m still playing catch-up on reader. I have read soooooo many good ones this week I wouldn’t know where to start. Seeing the finish trim molding going up was such a joy even if it does bring work with it! That my TO DO list is never a done deal no matter how hard I try. I found the coolest idea over at Martha Stewart. The following instructions are from her site. All of my glass jars are written on with Sharpie on the rear or the bottom, but this idea of Martha’s would be soooooooooooooooo much better. 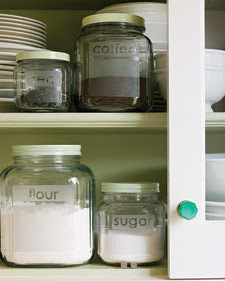 Keep pantry staples organized with a set of glass storage jars customized with etched lettering. 1. Clean and dry the glass. Using painter’s tape, mark off the area you want to etch. 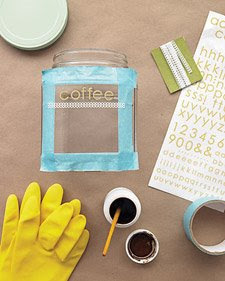 Attach vinyl stick-on letters and decorative tape; press hard to ensure they are attached firmly. 2. Cover work surfaces (be sure to work in a well-ventilated area). Put on protective gloves and an old shirt with long sleeves. Paint an even layer of etching cream onto glass. Let stand for amount of time indicated by manufacturer’s instructions. 3. Rinse with warm water in a stainless steel sink. (Avoid porcelain sinks; the cream damages glazed surfaces.) Remove letters and tape. Barbara over at Candy Hearts and Paper Flowers has been hosting the Homemaking September Shape-Up. 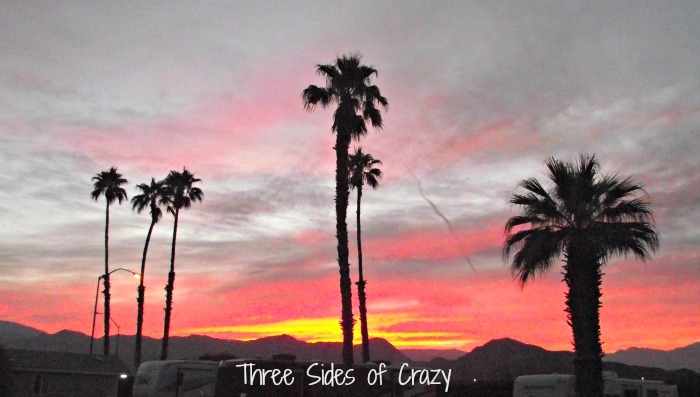 She had asked me to do some guest posts as well as other bloggers. I got this great package this morning, ON my birthday – she couldn’t have timed it better. It has a birthday card, a thank you card for a package I sent her and 1/2 of a Hallmark ornament set so we both have a 1/2, a CD of the songs to clean by and this great antique guide to entertaining (we may have to revisit some of the earlier posts on The Revival of Common Courtesy if I find some really good stuff). I can’ t wait to explore the great book. Thanks again Barbara! I love it and it meant so much to me that you remembered. and wished me Happy Birthday. Barbara over at Candy Hearts and Paper Flowers has been helping us shape up our homes during the month of September. And while I know she will get to these things as the month progresses, I thought in the spirit of the theme, I’d share what I did today. Last night we experienced our 4th (that I know of) frost and so when today turned out cool, brisk and clear (at least it started that way) I decided to undertake the major fall deck transformation. Here in the north woods we get a significant amount of snow so I always put away EVERYTHING versus just covering it. Thank God for the barn! Straightening the barn and making room for everything. Then I tore apart the BBQ and ran all the pieces (grills, grease traps, tools and burners) through the dishwasher. I picked up all the various sprinklers, hand nozzles, trowels, plant supports, rakes and shovels and put them away. Then I made sure the lawn mower and trimmers were put away too. I emptied the dogs pool and scrubbed it clean with soap and water and set it aside to dry. Then I drug and I do mean drug (I think they gained weight over the summer) all the lawn furniture into the middle of the yard and rinsed them off. While everything was drying I collected all the summer lawn stakes and bird feeders (we use only suet hangers in the winter) and put those away too. I got out the fall lawn stakes and my stacking pumpkins. I’ll leave the rest of the Halloween decorations till next month. These are just my harvest ones. When the lawn furniture and dog’s pool were dry I drug them up to the barn and put them away. After the dishwasher finished I put the BBQ back together, covered it and stored it in the barn also. These two didn’t help at all either – spoiled brats – LOL – this is all they did while I was out there with them. I tracked a lot of stuff into the house and then had to vacuum too! While I was on a roll I drug out the shop vacuum and did the basement stairs and basement too! WHEW! I’m tired and it’s only lunch time. We ended up with a surprise visitor(Eric) for the week so I’m editing my menu plan quite a bit and am making Taco Ring Salad tonight. I decided while I was at it I’d do enough meat to freeze 1/2 for the meal during the Christmas gang’s visit. So all in all it was a VERY productive day! 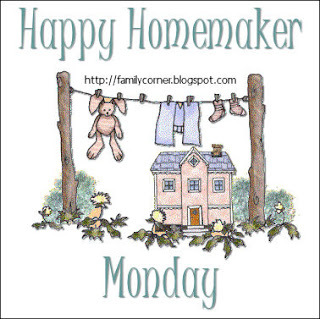 Barbara over at Candy Hearts and Paper Flowers is hosting the Homemaking September Shape-up. 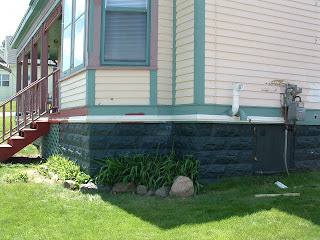 It’s an all around comprehensive house to home style of posts to help us get our homes and lives whipped into shape. She asked me to write some guest posts for the kitchen section and I’m so excited to help her kick off this whole idea. I’m going to have a houseful for the Christmas holidays so I will use that as my example. Besides menu planning and doing everything you can to organize, my best advice is to use cutting boards to aid in stacking items in the refrigerator and use cookie sheets as lids in the oven so you can stack multiple dishes on each shelf and have room for the Turkey or Ham and all your side dishes so they’ll all be ready at the same time. For a crowd that will be around for an extended amount of time, I also try to prepare dishes in advance and freeze them when possible so that I don’t spend all my ‘visiting time’ in the kitchen. I may have spent the better part of a day cooking now, but it was well worthwhile as it will save me tons of time while my company is here. All the meals that aren’t already prepared have been proportioned out and seasoned before freezing so they’re immediately ready after thawing. Now I’ve given you a rather large example, so think how easy it will be to do just a Sunday family dinner after church? All the same principles apply just in a smaller proportion. *I’m using the same sauce on all of these so I made a HUGE batch which will save me soooooooooooooooooooooooooo much time!! I’m so embarassed, but promised Barbara I’d post these. Even me, the obsessive compulsive neatnik can let things go a tad too long! I found tops with no matching bottoms and vice versa – they all went for the donation box. I put the more seldom used pieces towards the rear and in the the big tote out of the way and the pieces I use almost daily towards the front and on top. Maybe we can get it to stay this way. Yeah right, LOL. 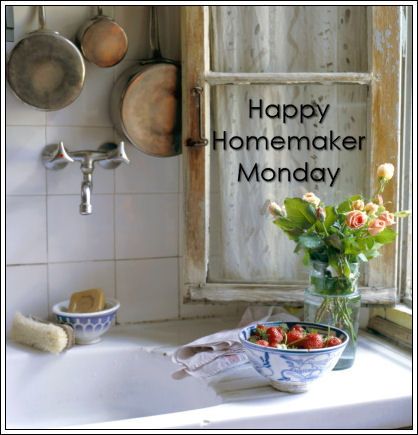 Barbara over at Candy Hearts & Paper Flowers is hosting the Homemaking September Shape-up. It’s an all around comprehensive house to home style of posts to help us get our homes and lives whipped into shape. She has asked me to write some guest posts for the kitchen section and I’m so excited to help her kick off this whole idea. My most recent experience of cooking with kids was with my girl scouts on some simple tasks or the time with Amber this summer. What readily comes to my mind is my grandma teaching me way back when. She’d let me wear her apron which she so cleverly converted into a size that fit me pretty well. Then she would bring a kitchen chair over to the counter and let me climb up on it. She would let me help her do simple measurements or read her the recipe (that she already knew by heart, but wanted me to learn to understand) or stir pancake batter. When she taught me to measure it was EXACT. You used a table knife to level off the top of the measuring cup. She also taught me how to make the best cakes with double sifting. These days they say you don’t need to sift, but I feel I get a better texture and moister cake by still sifting. No matter how old they are, kids want to help in the kitchen and we should be glad and welcome their eagerness. Much of our life revolves around food and cooking in one way or another and boys as well as girls should learn at the very least, the basics. As Barbara pointed out, even finicky eaters become better eaters when they are a part of the process of making their own food. You can include children of all ages in any food preparation. Just be aware of their capabilities and base their tasks on that. For example, every kid wants to wield the meat cleaver, but probably shouldn’t. Start their tasks with simple ones like learning to measure correctly, snapping beans, washing vegetables, measuring rice, when to add the different ingredients and even simple things like cracking an egg which can certainly be messy, but every kid wants to do it! Grandma taught me to crack eggs into a separate bowl instead of directly into a recipe which turned out to be a very valuable lesson. You can always pick out egg shells if the only thing in the bowl is a single egg, but you don’t want to be doing it from a bowl with all your cookie makings in it. There was a point when I was using farm fresh eggs and let’s just say I was certainly glad I still used that separate bowl for eggs or my whole cookie batch would have needed to be tossed out. Kids can roll dough or meat into cookies or meatballs. They can use a fork to criss cross the tops of peanut butter cookies. Teaching them to clean up as they go will also be a benefit in so much of their life! If all goes well, this will also bleed over into cleaning up their toys and/or rooms. As for that meat cleaver task at hand, you can take turns so that their tasks don’t involve the sharp implements, but yours do. Most importantly make it fun for you and them. The more fun they have, the more likely they are to want to learn more and more. 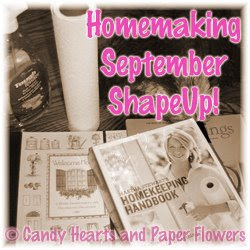 Barbara over at Candy Hearts & Paper Flowers is hosting the Homemaking September Shape-up. It is a comprehensive house to home style of posts to help us get our homes and lives whipped into shape. There are many ways to make your life easy to still have made from scratch recipes every day of the week and not resort to hamburger helpers or take out. By having a menu plan ahead of time you can get organized whenever you have the time. When I do the shopping I buy in bulk to cut the cost and since I have my menu plan ahead of time, I break down the bulk package into meal appropriate sizes before freezing when I get home. During the winter, I like to spend Sunday afternoons preparing for the week’s meals. If I know we’re heading into a particularly busy time I always make double batches and freeze half for another meal. There are times we literally eat out of the freezer for the whole week, but they are all homemade meals. Remembering to defrost your meat is key to easy meal preparation on weekdays. The most time consuming part of cooking with fresh ingredients every night of the week is the chopping and preparation of vegetables. If you are sticking to your meal plan you can do these all at once. For example if you are going to need a 1/2 cup chopped onion for each of 3 meals, then choose a large onion and chop the entire onion, storing it in Tupperware and taking out what you need for each meal as you need it. I also gather together the seasonings for each meal and have them ready to go. The key here is to be able to start cooking immediately and just add ingredients without having to do chopping and prepping. She has asked me to write some guest posts for the kitchen section and I’m really excited to help her out. We keep a pretty concise calendar with everyone’s activities, appointments, meetings and such on it. I also write what we will be eating on each day so they’ll know what to expect. For the planning purposes here I’ll show you the rest of the month so you can see the pattern(s). If for some reason we have to cancel a night I will rearrange the week so that the meal actually canceled is one using something from the freezer, not the fresh ingredients I’ve already purchased. When I do the shopping I buy in bulk to cut the cost and since I have my menu plan ahead of time, I break down the bulk package into meal appropriate sizes before freezing when I get home. As you can see the theme for this month is chicken with a bit of hamburger thrown in. Anything with seafood is made with shrimp from the freezer. The Beef Stew is also from the freezer and was made previously. By the middle of the month I will harvesting apples from our own tree and putting up applesauce for the winter. As you can see based on the previous pantry and essential ingredient posts, the only fresh ingredients I’ll be buying are the produce as well as milk and eggs.